Air duct cleaning is a highly specialized process that entails cleaning both invisible and visible portions of your heating, ventilation and air conditioning (HVAC) system. 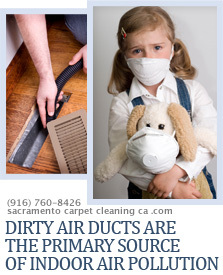 Whether you have a large, complicated environment control system or a small, one-family unit, Air Duct Cleaning Sacramento is the only air duct cleaning service to call. Their highly trained staff uses only state-of-the-art equipment and Eco-friendly products and techniques for air duct cleaning, ridding your air conditioning duct, dryer vent, furnace, and other parts of your HVAC system of unwanted dirt, dust, debris and bacteria. First things first. Responsive duct cleaning refers to vent duct cleaning conducted in response to specific indicators. The list of indicators includes: excessive dirt, debris or dust; vermin infestation; sudden respiratory issues related to mold, bacterial growth, and dust; headaches or sinus congestion; excessive dust in the home - after cleaning; visible mold growth; stale or musty odor when system is turned on. Preventative duct cleaning refers to conducting the process when no visible indicators are present. A home or business own may choose to have ducts cleaned in an effort to improve the overall functioning of the HVAC system, and improve indoor air quality as well. Seeing that air ducts carry air to and from the HVAC system, there is recognizable logic behind this line of thinking. However it must be mentioned that there is, as yet, no conclusive evidence that preventative duct cleaning actually improves either the efficiency of the system or the quality of the air. 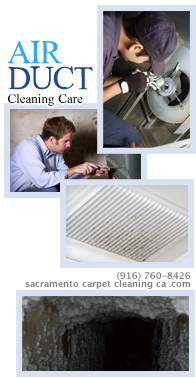 Listed below are some recommended steps for maintaining clean and healthy air ducts. Change furnace filters and air filters regularly. The frequency with which you will have to change your filters depends on several factors, such as type of unit, type of filter, whether or not you have pets, young children or individuals with respiratory sensitivities living in your home. Check manufacturer recommendations and air filter/air purifier instructions, as well. Clean the visible elements of your system regularly. Letting dust and dirt accumulate is not only unsightly, left in place they will inevitably clog the intake/out-take mechanisms of your system. Replace filters as necessary. Unfortunately, there is no handy formula for how often to change your air filters. Factors such as type of filter being used, type of system and frequency of use must be taken into consideration. Follow manufacturer instructions and recommendations. When changing filters, and during inspection, look for open spaces or gaps. Dirt and dust can find their way through even small breaches in the seal. Moisture trapped in the system provides the perfect environment for mold and other bacteria. Proper joint sealing, insulation and efficiently working cooling coils will keep moisture and condensation at bay. During times of remodeling or construction, insist that your contractor thoroughly seals off the area using whatever means necessary to prevent dirt or dust from entering the system. It is important to leave the system off during this period. Efficient housecleaning that eliminates or limits the amount of dust will, obviously, limit the amount of dust that will eventually find its way into your HVAC system. Carpet Cleaning Sacramento provides a variety of house cleaning services to assist you in your efforts to keep your internal environment as clean, healthy and breathable as possible. Call (916) 760-8426 today for a free estimate. Do not forget to ask about how you can save time and money by creating your own custom cleaning package.